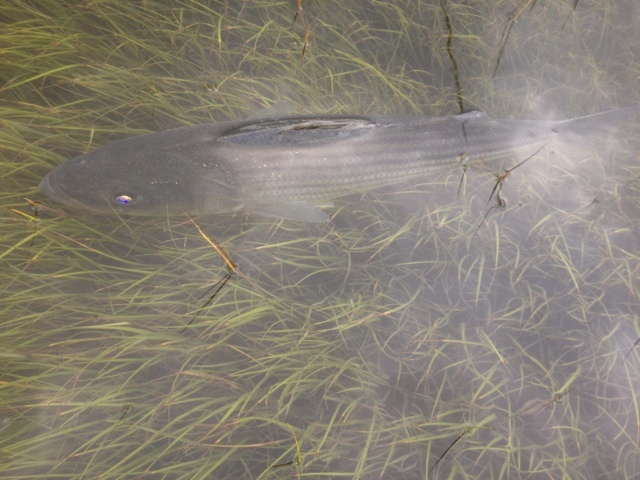 A striped bass hunts on top of the marsh. The conditions for red drum and speckled trout have not lined up this season, yet. However, the stripers are always fun to stalk. Today they were up on the marsh during the flood tide. This is really a lot of fun, as the stripers will hold in the grass. The above striper held tight as we approached. I was able to get a couple of pictures without him even flinching. When he finally realized we could see him in the grass, he darted out of sight in a split second. Today we cherry picked stripers for hours.